Pull the rake toward you as you exit the bunker. Do not pile sand at the edge of the bunker. 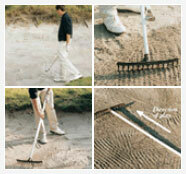 Push back excess sand with reverse side of rake. 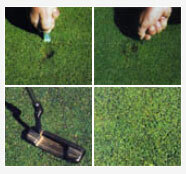 Use the repairer around all sides and slowly ease the turf toward the centre of the mark. Do not lift the soil upwards. Tap down lightly with a putter. 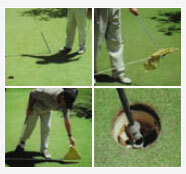 Don’t drop the flagstick on the putting surface as it will cause damage. Always lower the flagstick by using a club or by hand. Avoid damage to the surrounds by placing the stick in the centre of the cup. Greenkeepers have right of way and playing while they are in range is unsafe and not permitted. All players are to wait for direction by the greenkeeper as to when to play. Greenkeepers will always endeavour to minimize waiting time. All watering of the golf course is scheduled to begin late afternoon and run throughout the night to early morning. 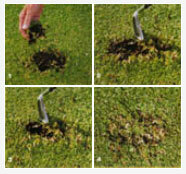 Late players may be affected by sprinkler system on some holes. During extreme weather, some watering of course may be done during the day. Unfortunately both these inconveniences are unavoidable. We appreciate your understanding of this important maintenance.